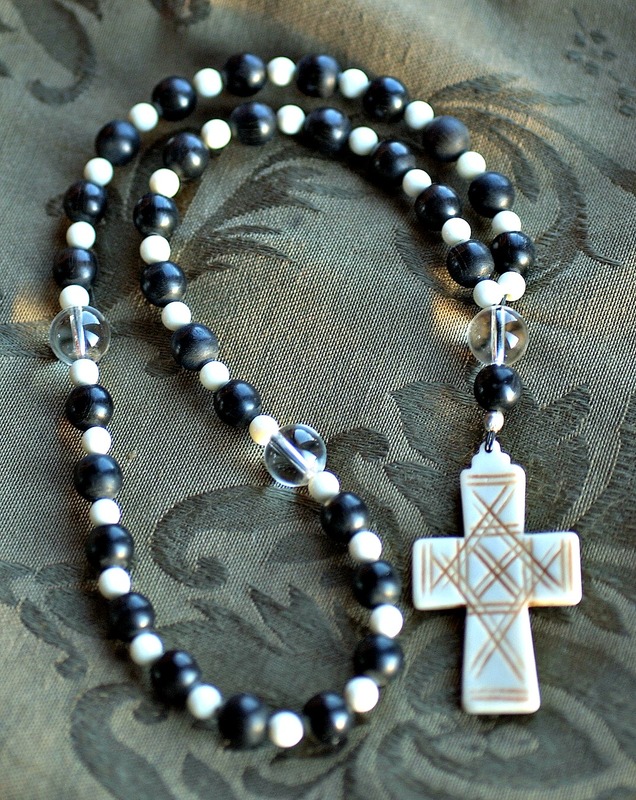 Over a year ago I wrote a blog on Prayer Beads. Chatting with people in my shop over the past year has consistently brought up some specific questions. The majority of my customers who are looking for prayer beads have European personas, they know that they should be “using” prayer beads as an accessory, and they do NOT know what the prayer beads should look like. The first important thing to realize, if you are familiar with modern rosaries, is that most of the standardization of rosaries for the general public has occurred in the last 100 years. Prior to that time geographic regions, various religious orders, and personal preference and wealth were all very important considerations. So, you want a set of prayer beads, but you do not have a “totally focused” persona from a very specific town? If you are male – get a tenner, and if you are female get a three decade rosary. Now what does that mean? Let’s discuss the geography of a rosary. The standard number of Ave beads in a decade is 10. An Ave, or Hail Mary, bead is used to say the prayer that begins, Hail Mary full of grace… But remember, no matter what your native tongue, if you were a regular Roman Catholic in Europe, you said your rosary in Latin during the Middle Ages, so that would have been Ave Maria Gratia Plena. The decades in a rosary are separated by a Paternoster, or Our Father, bead – this is where the Our father who are in heaven prayer goes… in Latin of course (that is what Paternoster means). Medieval rosaries were usually ended, or decorated, with either a tassel or a cross, the use of a crucifix on a rosary is extremely rare prior to 1600, but becomes more common after that date. And the difference, in case you are not sure, between a cross and a crucifix, is the presence of a representation of the crucified Christ, hence the name, crucifix. Crosses could be one piece or made of several beads. So back to my persona recommendations! A tenner is simply a string of ten Ave beads with an end bead, known as a gaude, or a cross, or a ring, or sometimes a tassel, or a combination of those things. If you are in a German speaking area, it will be called a Zehner – you guessed it – a tenner. Women use them too, but they are definitely the most popular form that we find for men. This picture shows a tenner with coral Aves (the black and white beads are just spacers), a carnelian cross at one end, and a ring at the other end. The ring can be used for hanging the rosary off of a belt, or if it is large enough, it can be placed on a finger to make it easy to carry and use the rosary at all times. And what about the three decade rosary for women? This form is usually made into a loop, for easier carrying. So we have three sets of ten Ave beads with a larger Crystal Paternoster bead separating them, and a tassel or cross at the end – like this. I hope that this brief blog helps to demystify what sort of rosary your persona should be carrying. Next time I will discuss the details of bead choices, tassels and crosses. This entry was posted in Dress Accessories, Jewelry, SCA Life by Eirny. Bookmark the permalink.